You stupid Lubbockites before whose eyes Jesus was publically portrayed as crucified… Who has bewitched you? (Galatians 3:1). 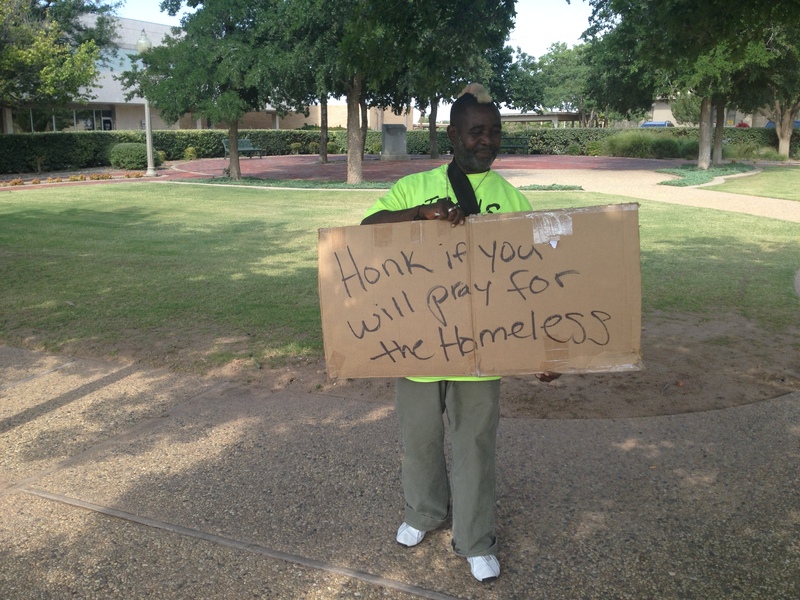 I am seeing Lubbock’s homeless in the headlines a lot recently because of the mess they tend to generate. Sadly, this is deeply misguided for a “Christian community.” How many excuses do I need to make? If you are classically white, middle-class, do you not have attics, garages, and storage units full of your glutted mess? Why do you look down your nose on a man who has no home for his gluttony? 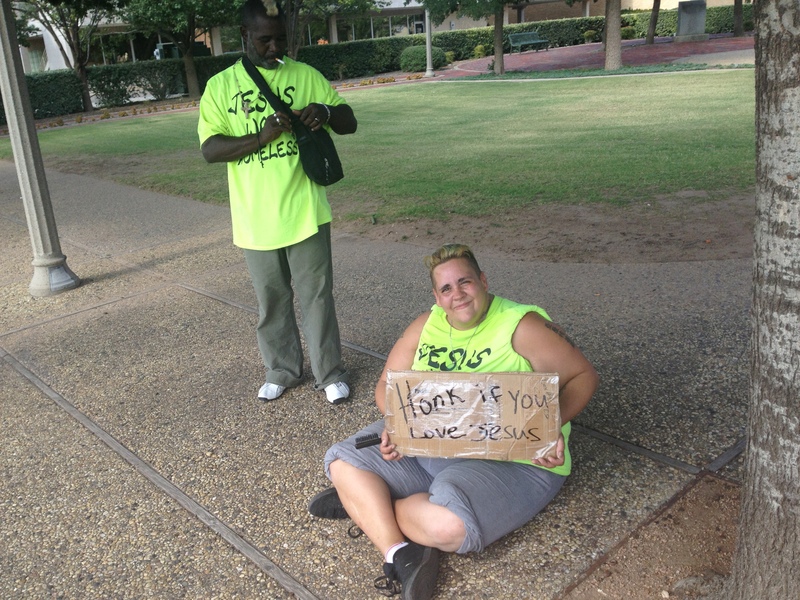 Numerous times I hear the notion floated out there that if Lubbock shows kindness to the homeless, it will only attract more of them. This notion is a response to stories of the messes generated. Apparently that is a bad thing??? I am quite sure that notion is floated out there by voters for the critical consideration of other voters. But this is a “Christian community!” So, enough with the excuses! 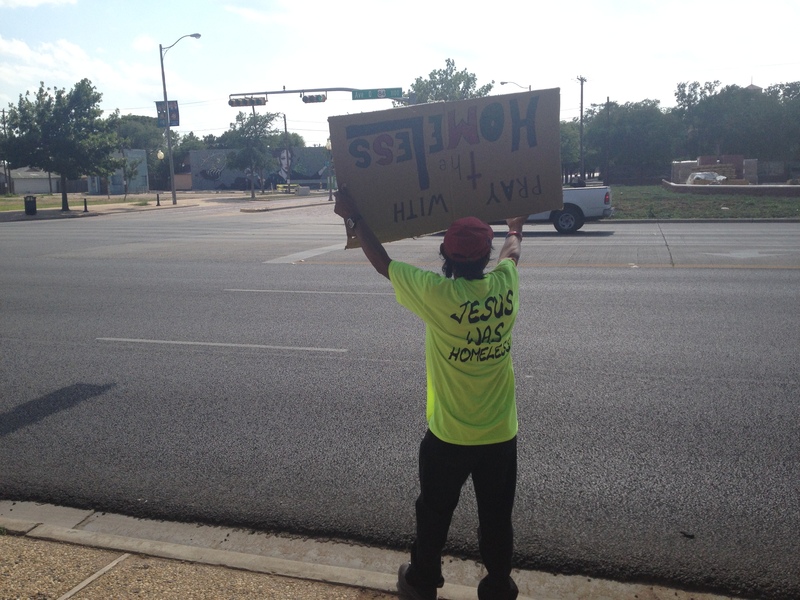 The preacher at Vandelia Church two weeks ago cited Lubbock as professing to be 85% Christian. I hope that with 85% of our city claiming Christ, we are more focused on the image of Christ than on the mess and burden of our homeless brothers and sisters. Yes, their lives are a mess, but that is Jesus you are looking at (Matt. 25:40&45). So, think about this notion – from a Christian perspective: Jesus crucified at Golgotha does not raise property value for voters, but the mess there sure raises the value for believers whose citizenship is in Heaven (Phil. 3:20). You have a chance to draw near to God if you turn (repent) and face the mess thus seeing the Reign of God come on earth like it is in heaven (Mark 15:39). You will find a party there (Luke 14:13; Ps. 23:5). You are invited (Rev. 2:17). It takes faith to find Jesus in that mess, but I hope you will. Hey, I am no trained journalist. I am not a TV reporter. I am no Newspaper guy. I am just a lowly servant of God. A prophet – seeing – and then telling what I see. A prophet doing – mostly imagination expansions with worship. I go to the streets with a sensitivity for the humanity there. I don’t see a mess or a nuisance; I see the image of God. I don’t make excuses for the mess, I accredit it to God. When the young prophet embodying Israel’s God enters that Temple and throws tables, scatters the money, and drives everyone out with a whip, He makes a mess for the people of God in that place of worship to clean up. This is God coming home. The Master of the House returns unexpectedly. So, yeah. I write of what I see through that kind of lens. They don’t train journalists to do that. Perhaps you find my craft less than professional in some sense. Well, I saw… and now I am just sayin’. 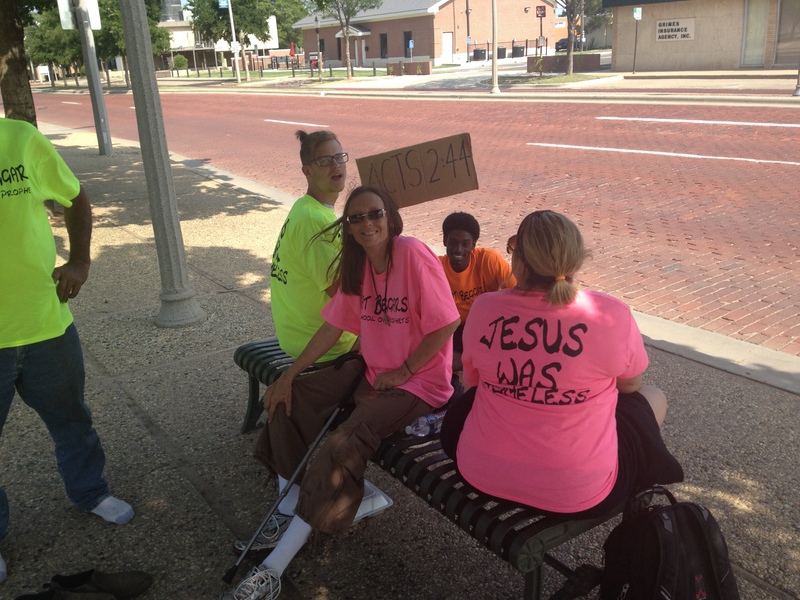 I talked with a believer from the streets this evening who described how God has been dealing with her. She said that God was calling her closer to Him and to ministry by calling her to read her Bible. She began reading and devoting herself to the Word. In time other street people began asking her about God. She did not push her devotion on them; they came asking. But then she would get high. She said this went on for some time. She was drawing closer to God, but she was still getting high too. But as she witnessed to others, the dope began to bother her. In time she felt the need to approach others with the Good News. But still there were some who would seek her out as well. And the dope was a deep inconsistency in her life and witness. Finally, she stopped the dope. She said she is 28 days clean. I am fascinated by this. 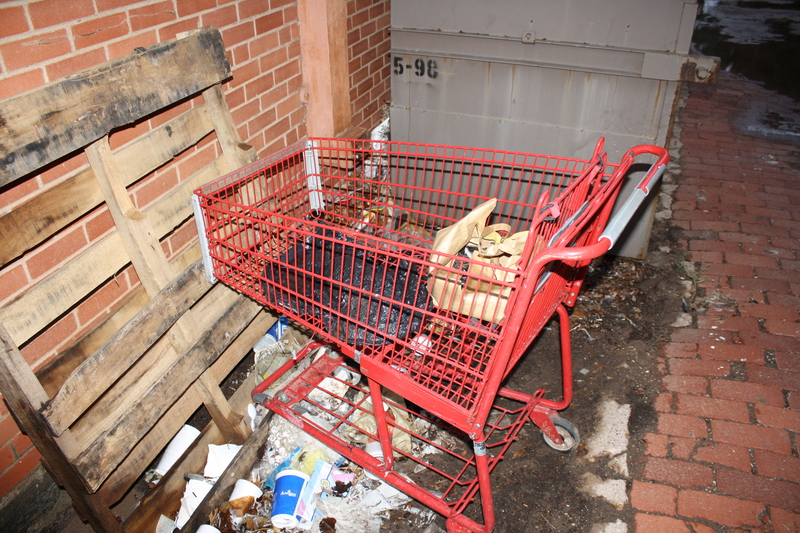 Coming to the Lord is messy business on the streets – especially for the addicts. 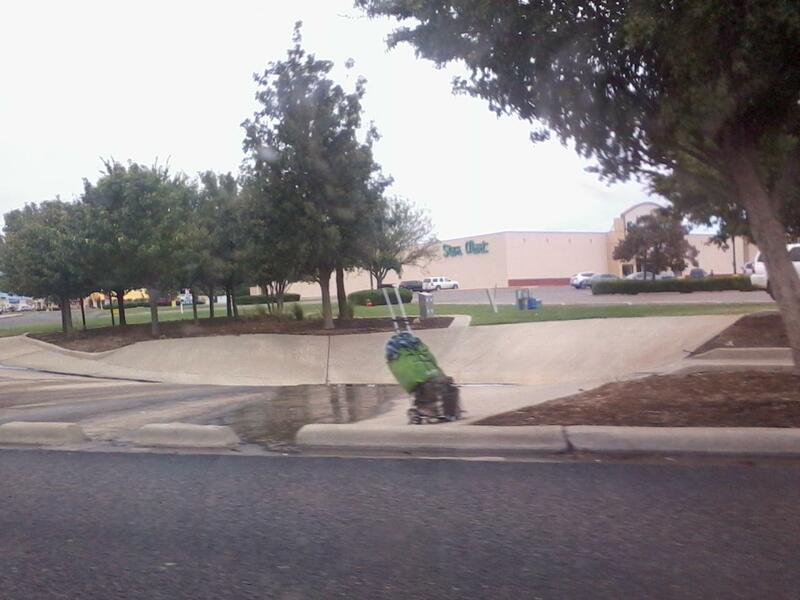 She is still every ounce a street person pushing a buggy and all. But she is a street prophet too. Yet I cannot imagine her “fitting in” at any church I know. I cannot imagine her church-shopping until she finds a place where she is “comfortable.” I certainly cannot imagine a church being comfortable with her. Take a meal to the streets. I am not saying food distribution here; I am saying a meal (like a picnic) that you share with others, if they accept your invitation. You have heard it said: Don’t give money; give a sandwich. I am saying: Share the sandwich. You might not find anyone to share it with. Sometimes I don’t. If that happens, take your meal to the corner of a busy intersection (think: 50 & Slide, Ave Q & Broadway, 82nd & Quaker) – somewhere a picnic normally does not belong and yet is highly visible to the public. Then sit down on the curb, offer a prayer of thanks, and eat. You will wonder why you are doing that. So will the public that sees you. Some will mistake you for homeless and give you money. Some will mistake you for homeless and sneer. Most will not notice. But you will have walked a mile in the shoes of Jesus. You will see Lubbock in a different light. You will have a new insight to share with the poor. 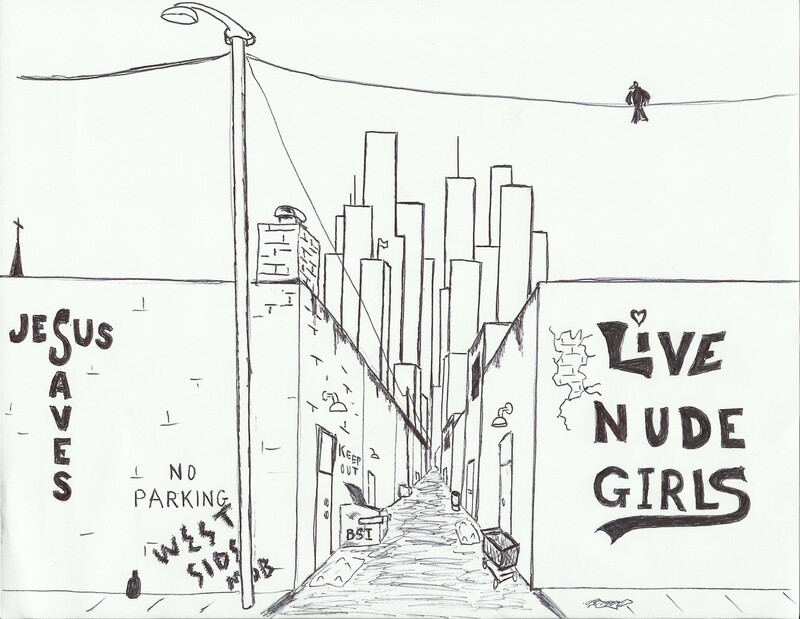 Take a pack of cigarettes to the streets. Find people in parks, street corners, behind dumpsters etc., and give them a smoke. You will make a lot of smiles happen. You will break the ice between yourself and the poor. You will find that more than 85% of the time, someone will go eat that meal with you after you do this. While you are sharing the meal with someone you gave a cigarette to, ask if they will pray too. Lead them in The Lord’s Prayer. Sing the first verse of Amazing Grace (everyone knows the first verse!) or sing Jesus Loves Me. Share a bit of cracker and grape juice in thanksgiving for the body and blood of Jesus our Savior. 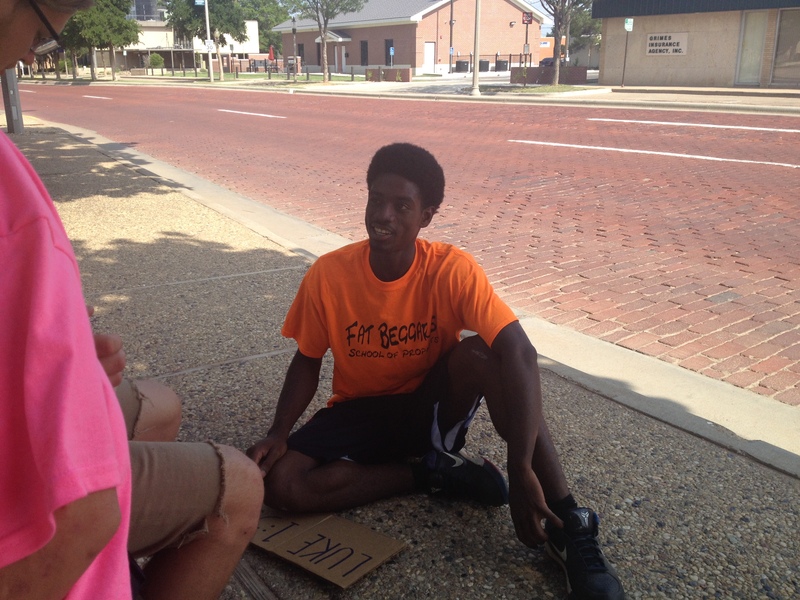 Then you have communed with Jesus on the streets of Lubbock. Go home. You are done. The whole ministry outing only cost you $10 if you are frugal. It will be seen in Heaven and remembered on Judgment Day. No one can convince you that your Helping Hurt. It is all good. I really don’t know where to start. I don’t know what point to make. But I know that today’s ministry overwhelms me, and I am sorry that I am not adequate for the task. I met a man, we will call him Agent Li’l Psych-O (ALPO). He was a really sweet guy. Well, not at first. Actually he was quite demanding. He fixated on numerous demands all at once. I tried to be a servant and meet all the needs that I reasonably could. I tried to allow myself to be “stretched” even beyond that. To make a long story medium, let me say that I took him to two churches to meet his demands before taking him to my old church Vandelia. I did not get any help at the first two. I did not ask at Vandelia either. I have decided asking permission is like asking a church to say “no” – setting ministry up for failure for sure. Better to just barge into that shower he asked for and then search for a towel after he is in the water. What can I say? It worked. Thank You Jesus! Thank you Vandelia. I reached out with a shotgun blast text message for anyone who might help get him some clothes. I got a response! And after an hour and a half waiting for him to finish his shower, we found him fresh clothes too, thank You Jesus. Thank you Restoring Hope! We picked through the bags of clothes and found three sets of clothes for him. And as I watched the clock approach our third hour (since church), he mentioned lunch. I reached out for a donor. I got none. Okay, we will go to my house. Now this was a concern because my wife who works the night shift was sleeping, and I feared waking her. But it was a risk I decided to take. But it was during the clothing raid that I began to realize this guy is telling some truly strange stories. In fact the more he socializes with me the taller the tales. His life sounds like a TV show one minute and a movie the next. On the way to my house he actually told me he invented the razor. Later he told me he invented the refrigerator. Hmmm… Wait a minute… did he just say JFK was his uncle??? Then he talked about his cousin Eddie Money and the song Two Tickets to Paradise. His aunt, Mrs. Money – Eddie’s mom – is rich. Her name is Money by the way. And his kin owes him money; that is probably why they don’t want to talk to him. Soon we were eating lunch at my kitchen table. He saw various items in the fridge and began requesting them. I accommodated. His stories just got more unbelievable. Soon I discovered he is kin to the Gambino family. I said, “You mean the crime family?” He got offended. “No! They’re not a crime family! They are honest hard working people! They run a restaurant and get a bad rap from the media!” Spoken like a member of the family alright! I can’t recall all the names he dropped. JFK, Newt Gingrich, Alice Cooper, Johnny Carson, Eddie Money, Lucky Luciano, and at least a dozen others. Most of them are kin. He even named Bart Simpson as a friend. And many of his stories were lifted right out of headlines of years gone by, TV shows, and movies. He was a mess of delusions. It was so innocent. So vulnerable. So needy. Like a child in a grown man’s body. He is nearing old age and looks weather worn from the streets. He had shaved his full beard in the shower with a couple of Bic Razors. He missed a few patches. He looked like he really feels self-confident, but ten minutes of listening – really listening – proves he is over half way to Alzheimer’s mentality. I put out a shotgun blast text message again. Please pray for this guy and consider keeping him tonight. He is so sweet. He does not smoke. His language gets offensive from time to time, but he is redirect able. 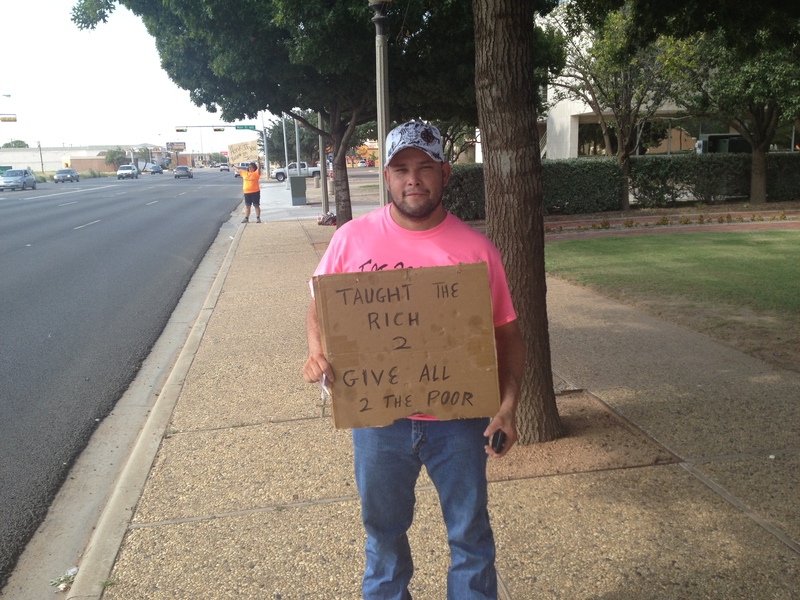 I got several responses of prayer, but no one offered to take him. I decided to call the crisis line at the psych ward. They assessed him. He figured out what I was up to and resisted for all he was worth. He did not meet the criteria of emergency detention, but they did offer to take him in if he would consent. He refused. He had a better idea, if I would take him to IHOP, we could find Eddie Money there – he runs the place – and he will give us some rib eye steaks that we can grill in the back yard tonight. Oh… ALPO… how I wish we could. I also realize that his manic state makes him a sleepless night. I do not have the facility for that tonight either. 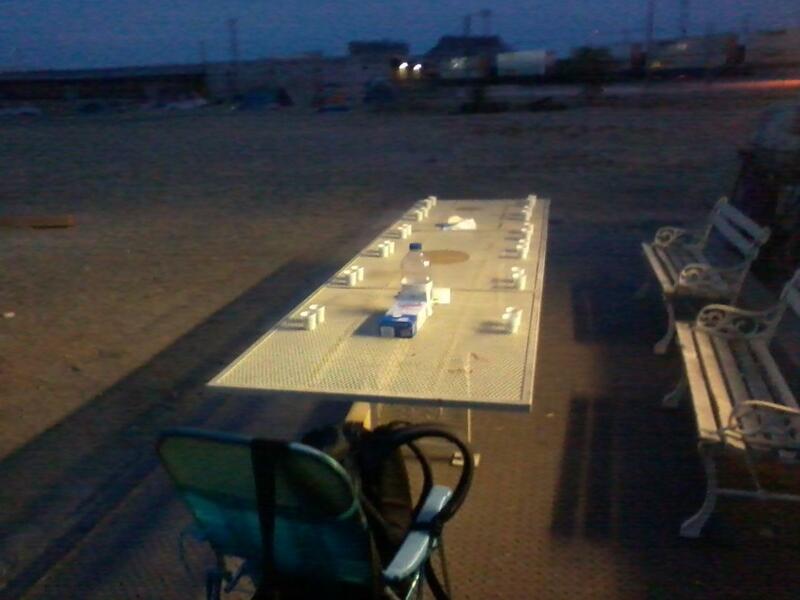 But then no one from church, not the hospital, and not even Tent City (yeah… we went there too) would take him tonight. I took him to Asbury Methodist for their evening meal and dropped him off. 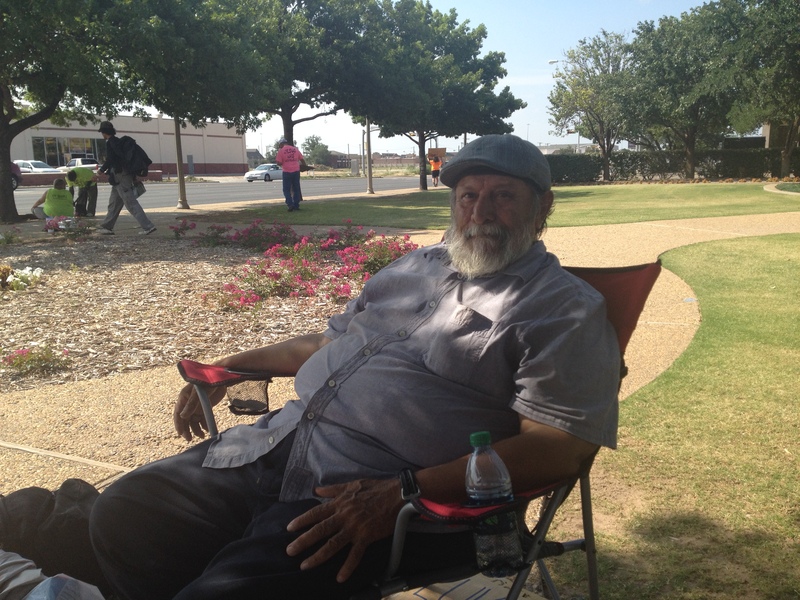 He has an appointment to get a tent at Tent City at 9 am tomorrow. I hope he can find his way there. I tried to show him the way, but it was about 3 miles away… several turns here and there. He could not shut up about being related to the Rolling Stones, “You know the Rolling Stones right?” I don’t think he was really paying attention to the directions. If you are reading here, please pray for ALPO tonight. I am. I don’t know what else to do. I met a man from the streets a few times. He appeared strong, tough, confident. Of course that raises the question: Why homeless? I did not actually ask. I just made presumptions. Tentative to be sure, but presumptions all the same. Then I spent time with him. We talked. I still did not ask. But as he talked, he spoke of how blessed he is. Then he spoke of better days – owning a home, raising a family, running a business. He sounded pleased with where he is now. He has a stripped down life. He has what is truly important now, his friends and his health – and none of it obscured by pretense. He lives from blessing to blessing never running out of food, nice clothes, and always with friends. Then we communed. We sang the songs. We prayed the prayers. Jesus came, and the man got high. Soon he began crying. He confessed that he is an addict. He has lost everything. He has a fiendish desire for dope. It hooked him too deep to do anything else. And with his wife dead and kids taken away, he can’t seem to find the will to live. And then he spoke about how he is mad a God. We spent our time together in front of a locked up church all through the night as he worried whether the cops would find us and haul him off to jail. Too bad the Sunday morning crowd wasn’t there to witness it. Too bad. So please read it here. And if you want to come along, please reach out to the homeless. You don’t need me, but if you want to tag along, I will take you on the next Covert Op, where like a thief in the night, God visits his house. I just got back from a Covert Op to crash a church after dark, hold a worship service, and spend the night. I am sure that in heaven that is known as a PR problem. I spent a lot of effort convincing this group to go to a church with me. They relented in the end, but there was much discussion over communion and amid prayer about how we might wind up in jail for worshipping and taking refuge at a church after hours. And so, though the shepherd went out and rounded up three strays, the mission is a covert op. I was talking recently visiting with one of the ministers from Restoring Hope and he made a remarkable observation. 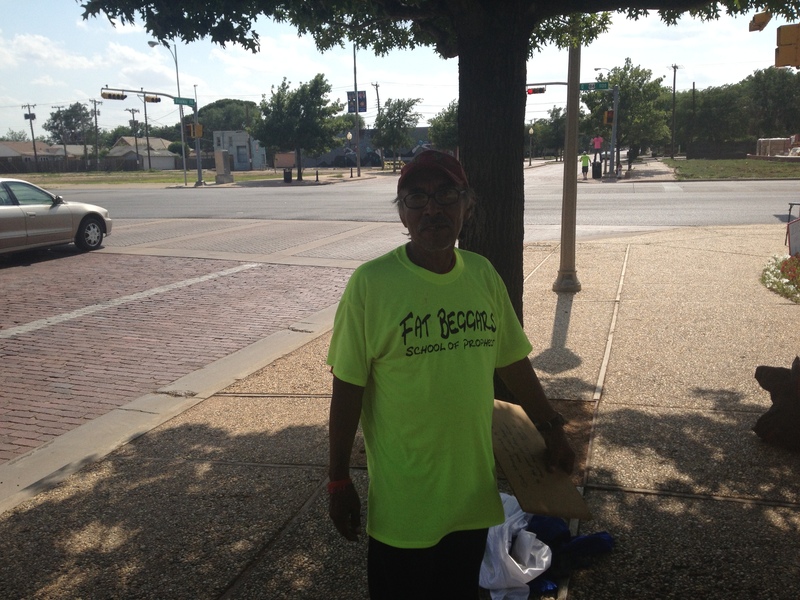 He asked, “When did homelessness become a business?” He told me that he asked this of the executive pastor at one of Lubbock’s premier homeless churches after that pastor raised tens, if not hundreds, of thousands of dollars yet has only housed three men in the last three years. I have noticed this myself, but I had never crystalized it into quite that crisp of an observation. I never wanted to fault a ministry for raising lots of money. But it suddenly became clear that some of these pastors really have a lot of it. And this raises concerns about whether those ministries are in it for the money. If that is the case, they might really never want to actually end (or alleviate) homelessness. Other people’s pain is just too lucrative! Now talk to me about When Helping Hurts!!! But I recently had another conversation with the ministers from 7th Trumpet Ministries, and they observed that church has become big business. And that seemed to take the first conversation to a new level. If the church has become a business, then it is deeply corrupted. And in America, that seems to be the goal of church as far as I can see. 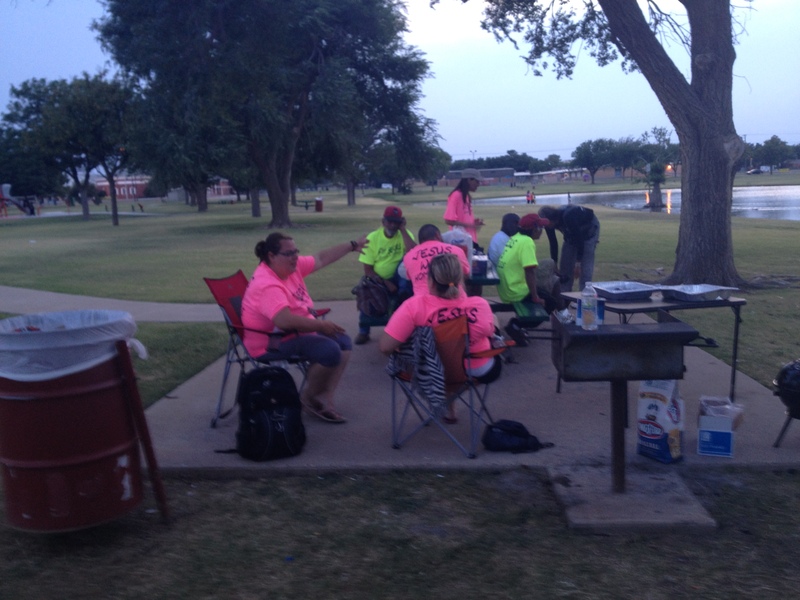 We are planning to host another all night campout/worship service with the homeless on the streets of Lubbock this summer. 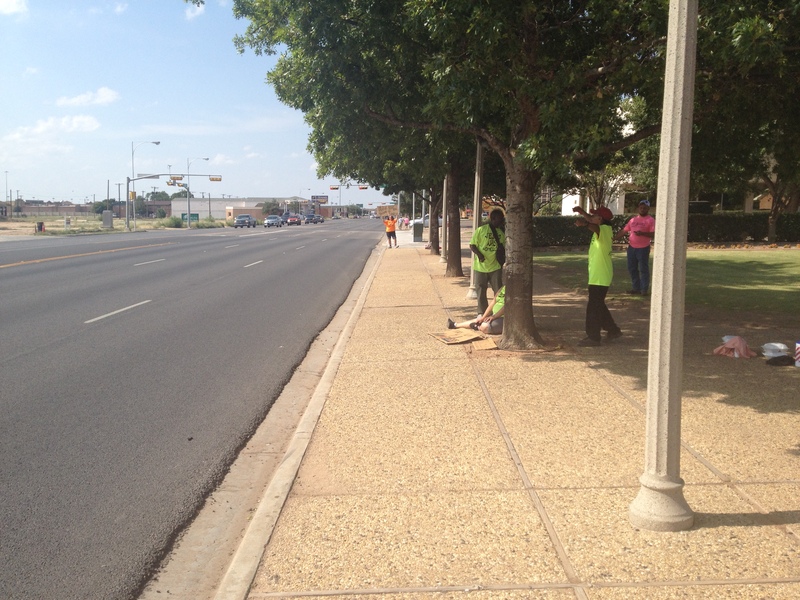 We did it last summer and called it the Lubbock Parade of Homeless. This year we have the help of Restoring Hope and the hosting of St. John Neumann’s Catholic Church. We plan to hold the event on August 1st (This has been changed to September 12th (Sometime in OCT – TBA)). We are planning for live music, worship, confession, testimonials, a cook out, a campout on church property, temporary shower facilities, breakfast, and Mass. The whole event should be festive and fun. 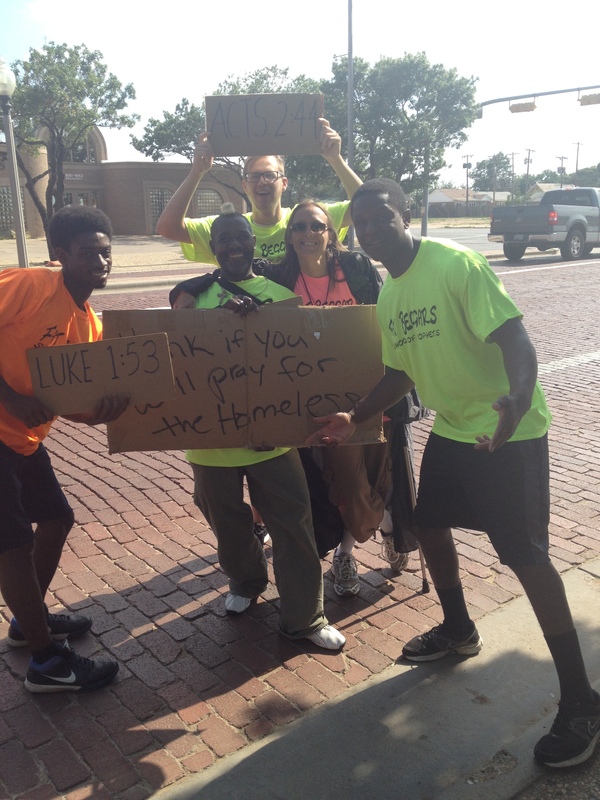 You do not have to be homeless to join the fun, but we certainly want to invite every homeless person in Lubbock to join us. You can come for a few hours or stay and camp through the night. Either way, please pray for this event. 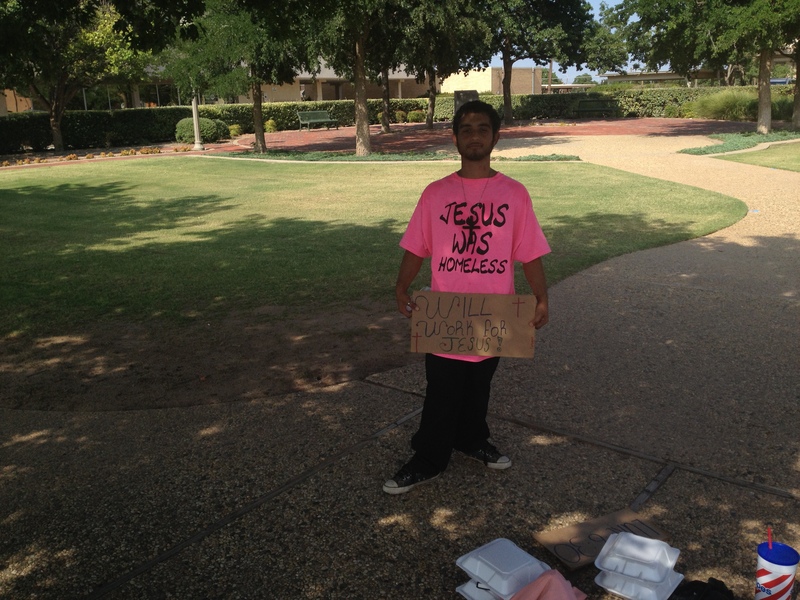 Pray that God come and express himself through the homeless and draw all of Lubbock to himself afresh in their midst. 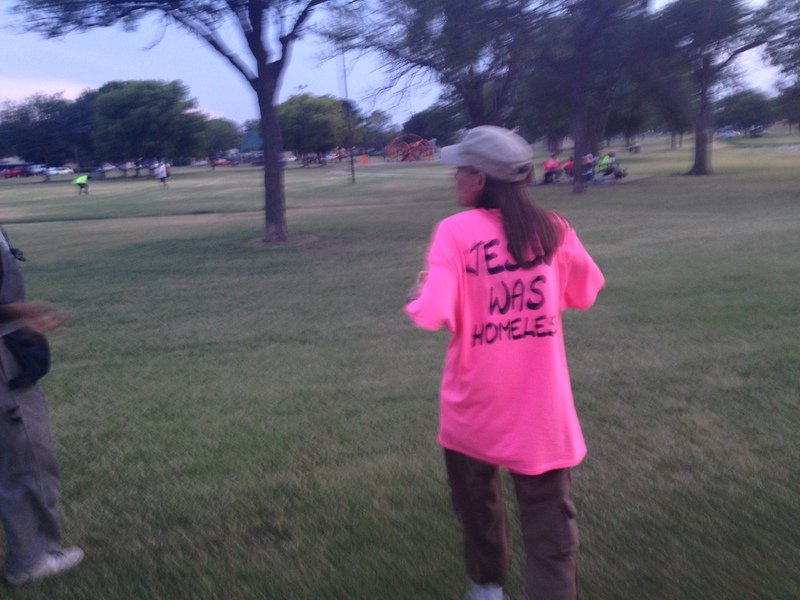 Way back in 2004, I joined a minister on the streets of Lubbock late at night. We took a communion service down to 65th Drive which soon became the sight of 3 shootings – in addition to all the drugs, prostitution, burglaries, and vandalisms. We found full block-parties on many of those occasions, and facilitated an invitation for Jesus to attend. Jesus (if you read the Gospels, you will know) attended lots of parties. They tended to be religious/national holiday celebrations commemorating some purpose(s). But he went there to upstage those celebrations with the in-breaking of the Kingdom of God. I have never stopped crashing the street parties of Lubbock in all these years. 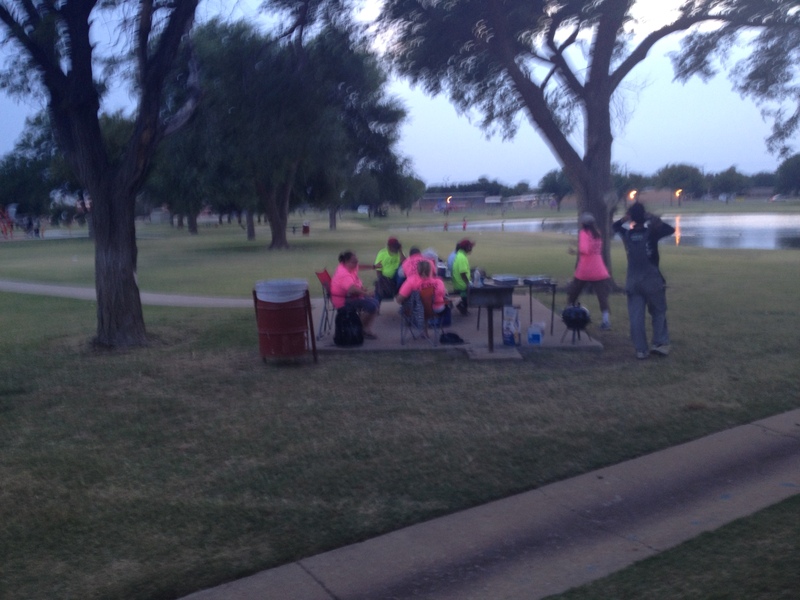 Lubbock looks a lot different after dark than the image we put in the visitor brochures. We are a “Christian community” – about as Christian as it gets. We are conservative. We hold strong to family values. At least that is how we present ourselves. But as I tour the streets late at night, I wonder where the church is. As I meet scores of little children completely unsupervised by parental oversight (some so young and in diapers they can’t speak!) 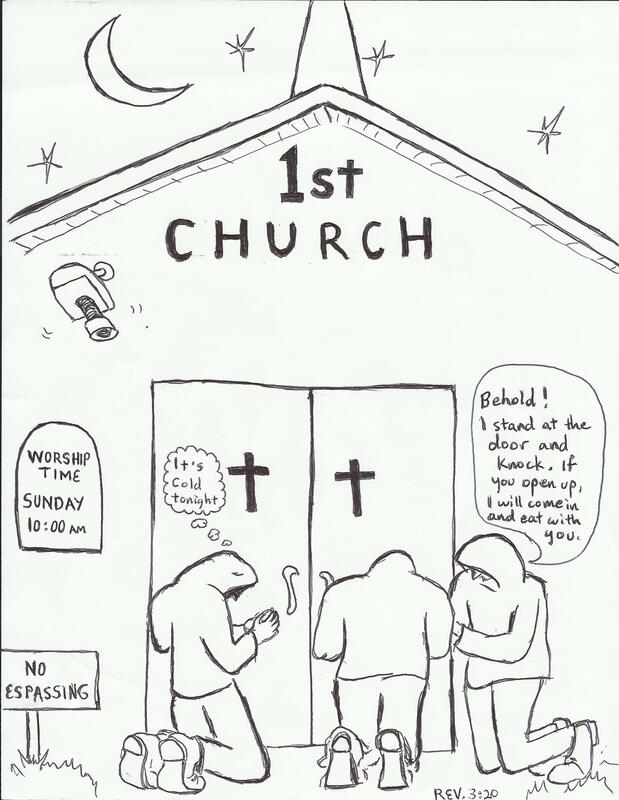 or a huddle of homeless drunks in the park under a tree, I look around for Jesus and find only locked up church-house doors protected from the parties Jesus would attend by ADT security signs and surveillance cameras. I propose we cut back just a smidge on all the parties we throw for the police or ourselves (how many ski trips does our youth group really need to feel closer to Jesus?) and take the hands and feet of Jesus to the party the whores, lepers, and beggars are throwing right out our locked up front doors late at night.